As an afterthought, device test is right up there with security. Like security, if it isn’t done right, the backlash can decimate a design team, or a whole company. As we tumble headlong into the age of IoT and wireless connectivity, device test is increasingly complex, but well-established practices and new test approaches make the journey easier. A big differentiator between classic electronic system design and IoT is the requirement for connectivity, in particular wireless, or RF connections. These come in many forms: Bluetooth, LoRaWAN, LTE Cat-M1, NarrowBand IoT (NB-IoT), Sigfox, Wi-Fi, Wi SUN and zigbee, just to mention a few. The choice of wireless interface depends on the application, with consideration to required coverage, data rates, device power consumption/battery size, security, link reliability, international regulations, mesh networking, range and latency requirements. Then there’s cost, size, form factor, technology ecosystem support and time to market. Cost and time to market are two forces that demand up-front attention to system test. Many design teams have not factored in the difficulties encountered when laying out an RF design so establishing good test procedures for an RF device is as critical as the design itself so that mistakes are caught early. Potential mistakes include poor performance due to sub-optimal antenna placement, not enough isolation between the RF and digital circuits causing mutual interference, as well as non-compliance with appropriate standards or international regulatory environments. In addition, if a device is meant for a cellular carrier’s network, such as in the case of LTE Cat-M1 or NB-IoT, the IoT device needs to be certified for that particular network operator. Along with the typical software debug that goes along with any design, RF-enabled IoT device tests must also include coexistence testing, power analysis, testing for electromagnetic interference (EMI) to make sure it’s not interfering with other signals, and that it’s capable of handling interference by outside interferers. As the device gets to the manufacturing and production stage, this also requires extensive RF test and different types of equipment. While IoT wireless device test is challenging, a wealth of knowledge is available from companies such as Anritsu, Keysight Technologies, Rohde & Schwarz, Teledyne LeCroy and Tektronix, all of which have extensive experience in general test and also test as it pertains to RF in particular. So, if wireless test is new to the design team, use the expertise they have, both online and on the phone. Wireless test equipment is required for IoT devices, and it’s expensive, so consider using test-equipment leasing companies, such as Continental Resources. However, some fundamental strategies include using RF modules instead of designing an RF interface from scratch. Modules are designed to meet the respective standard (Bluetooth, Wi-Fi, for example) and are usually pre-certified to national and international regulations, as needed. It’s somewhat misleading, but just because the RF module is compliant, that doesn’t mean the final design is compliant. Once finished, the full design must be tested to ensure it meets both performance and regulatory requirements. Performance refers to a device’s throughput and its ability to adapt to changes in the environment, all of which are affected by range, interference, other devices and orientation, just to mention a few variables (Figure 1). Testing the RF behavior of a device typically means putting it into a large anechoic chamber where the parameters such as interference can be controlled. Often only large test houses can afford such a chamber, so a device must be sent off for testing, which can take days or longer, for a single test or multiple tests. At a time when time to market and low cost are critical, this reliance on large test houses for small and relatively inexpensive IoT devices seems outdated. To address this concern, octoScope introduced the octoBox, a small, self-contained personal wireless test bed that can sit right next to a developer at the bench, or be accessed from anywhere in the world, using an IP address (Figure 2). The basic premise of the octoBox is that it completely isolates a device from the environment, while including an internal rotating table and multiple antennas that can simulate the signals a device would receive if it were in the real world and moving around. 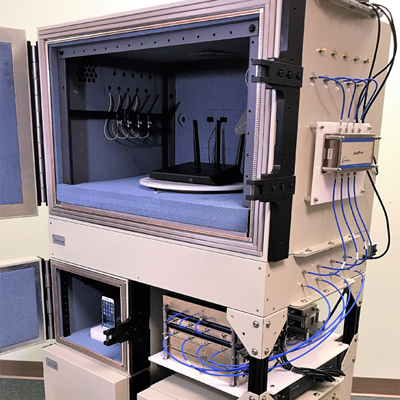 Multiple octoBoxes can be stacked so that two devices can be tested for roaming and hand-off testing, such as with Wi-Fi or cellular connections to mobile users or assets. As RF modules and development kits evolve with built-in cloud-connectivity and lots of software support, the integration of wireless connectivity is getting easier, but testing remains a tricky and time-consuming endeavor. For IoT solution providers looking to innovate-design-test-reiterate rapidly, personal test beds like octoBox can prove very useful.